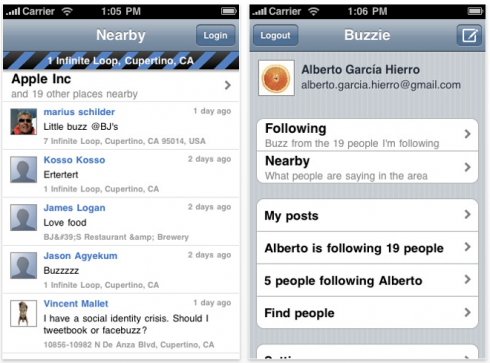 Google Buzz Gets a Native iPhone App, Simply Called Buzzie! Why did it take an iPhone app developer to come up with the first native app for Google Buzz? Isn’t Buzz not too interesting enough to merit its own native iPhone? Frankly, I’ve been waiting for this one. In fact, I was expecting something like this to come out earlier. Anyway, so there it is. Google Buzz now has its own native iPhone app and it’s simply called – Buzzie. It’s a simple, straight-out port of the Buzz webapp, so don’t expect too much from it. And besides, what can you possibly expect from an iPhone of the web’s latest noise maker?, I mean online communication tool. 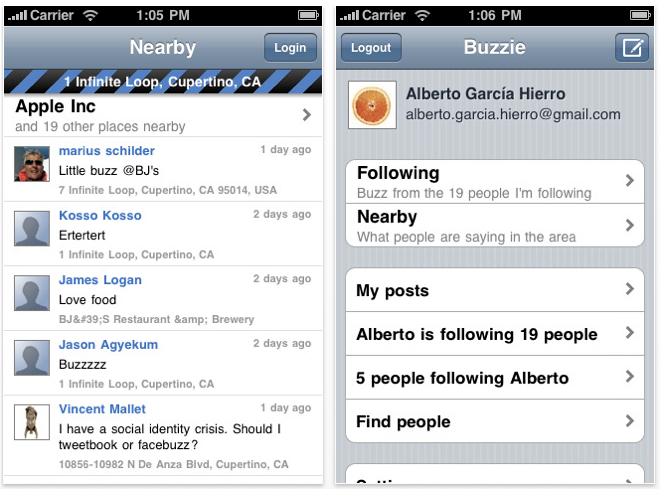 Simply put, Buzzie is good native app that would help you get your Buzz fix in a faster and easier way. Will you use Buzzie? Or is the Buzz webapp enough for your buzzing needs? If you want to get this app, here is its iTunes Link. The goal of this website is to raise some awareness on this issue and have people think about how they use services like Foursquare, Brightkite, Google Buzz etc. Because all this site is, is a dressed up Twitter search page (link). Everybody can get this information. So, what does the site actually does? Well, controversial as well. It compiles and lists down all the status updates published on FourSquare and perhaps soon other location-aware services as well, that pertains to individuals saying that they are about to leave their homes to go somewhere else. These are posted on the site and on Twitter. While Please Rob Me’s goal is unquestionably noble, the way it is pushing things to achieve this goal is not. Raising the level of awareness of the public over some dangerous matters is a good feat, but actually giving the would-be perpetrators an idea about this whole thing is certainly not commendable. The site posts those updates on their Twitter account for all its followers to see and monitor. Â They say that FourSquare, Gowalla and the others are just dressed up Twitter where updates live links that anyone can click through and access. But the thing is, those location-aware service still give users the options to set up their privacy settings and control who among their contacts they would allow access to their updates. So, I guess location-aware services are still safe, just like Twitter. TweetDeck as many of you might not be aware of is not only a great iPhone Twitter application but it is also a great social media management tool for your desktop. Â Actually the TweetDeck iPhone app takes its roots from the TweetDeck desktop client. If you’ve been using TweetDeck on your desktop before, you’ll be glad to know that version 0.33 is now available and promises more great features to help you manage your social media life easier. First of these new features is the extended API limit to 350 calls per hour. This gives those who configure TweetDeck greater flexibility without having to worry about running out of API calls. In addition, TweetDeck version 0.33 has also introduced an automatic API management option which is an ideal way for you to get the most out of your API allowance. Next new feature – the Column Navigator which shows a representation of all your TweetDeck columns and lets you navigate through each of the columns quickly by clicking on them. Even more useful is the fact that when you hover over a bar in the navigator, key information about the column content will be displayed including the time remaining before the column refreshes and the current level of API calls remaining. Another new feature that you might Â like is YouTube integration. Â Clicking on YouTube video links will now let you view the video in a TweetDeck preview window. This is also true for Flickr image links. Other new features of TweetDeck 0.33 include – ability to edit definition of search columns and a brand new help screen. You may download TweetDeck version 0.33 from here.